Not only will it give you the time. 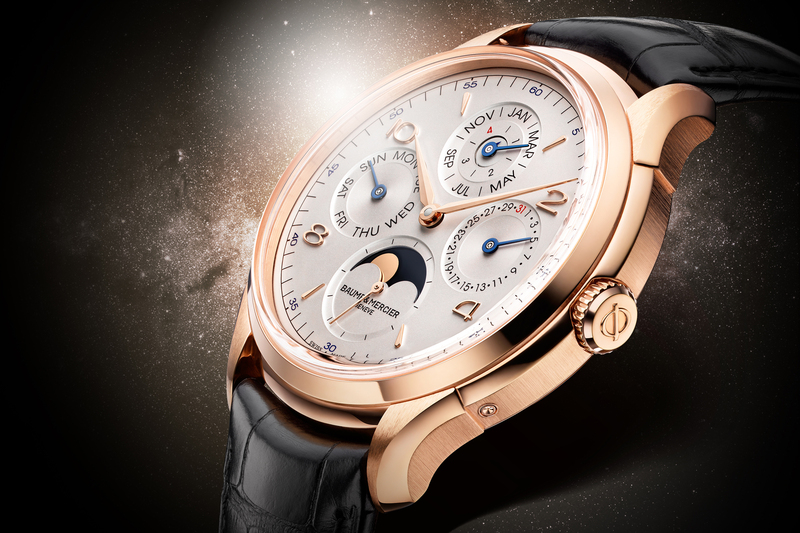 It will also give you the day of the week, the month and even the phases of the moon and all in a stunning red-gold case for a reasonable price. The Baume & Mercier Clifton perpetual calendar showcases one of the most successful and fascinating complications of distinguished watchmaking. The Clifton collection is my personal favorite from the brand, known for its affordability and elegance. Having a well-built, well-finished Swiss watch doesn’t have to break to bank. Baume & Mercier’s philosophy has always been to offer accessible timepieces (even with complications). 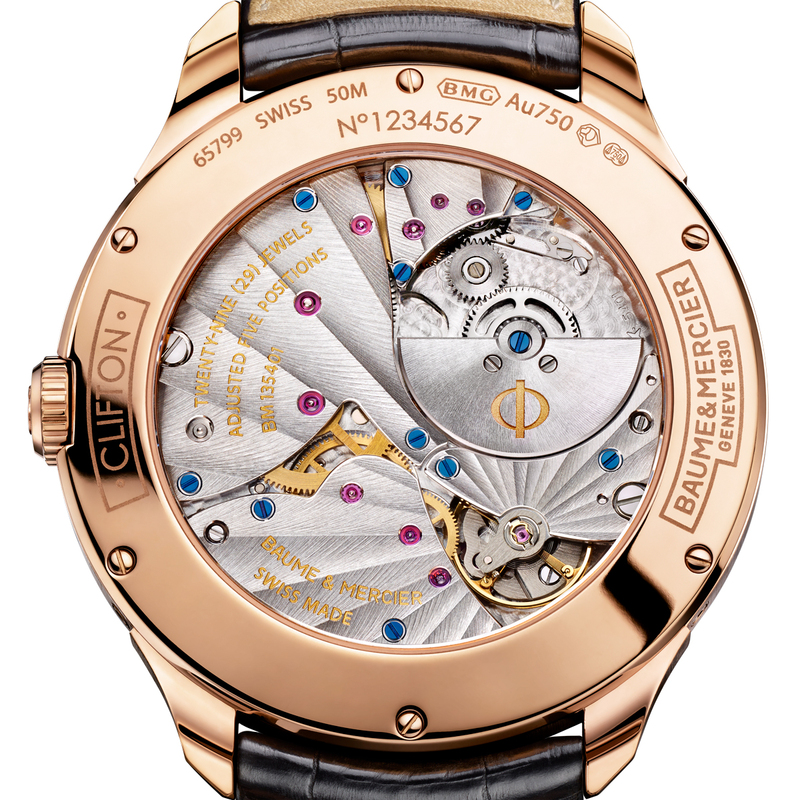 The Clifton Perpetual Calendar has a mechanical memory of 1461 days, the equivalent of four years, which animates the self-winding Vaucher 5401 movement within the watch, which also happens to be beautifully finished with Côtes de Genève on the bridges and stippling on the bottom plate. A micro-rotor, often the reserve of a select few in the watchmaking world, makes it possible to pare down the movement for a case that is barely 4.2mm thick. You can gaze into the caseback to appreciate the movement which ticks away at 21,600 vibrations/hour and boasts a power reserve of 48 hours. However, the highlight for me is the delightful raised sapphire “chevé” crystal, designed for improved readability which gives a vintage feel to the watch. 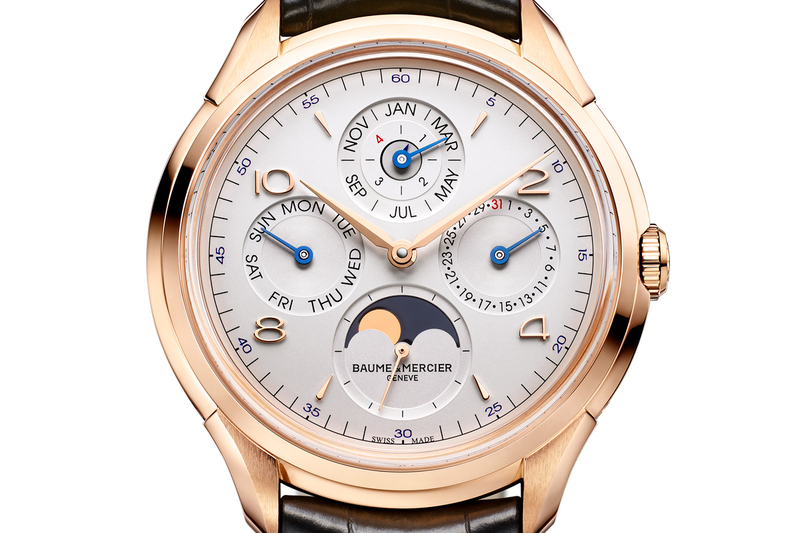 The dial is silvered opaline with numerals and stamped indexes in red gold and blued hands indicate the watch’s calendar functions. The date appears at 3 o’clock, the days of the week at 9 o’clock while the months and the leap years appear at 12 o’clock. The Clifton Perpetual Calendar represents the final piece in the collection, ultimately showcasing that Baume & Mercier is ready and able to produce more complex – great looking watches at reasonable prices each and every year.